China cut interest rates for the third time in six months on Sunday in a bid to lower companies' borrowing costs and stoke a sputtering economy that is headed for its worst year in a quarter of a century. Analysts welcomed the widely-expected move, but predicted policymakers would relax reserve requirements and cut rates again in the coming months to counter the headwinds facing the world's second-largest economy. The People's Bank of China (PBOC) said on its website it was lowering its benchmark, one-year lending rate by 25 basis points to 5.1 per cent from May 11. It cut the benchmark deposit rate by the same amount to 2.25 per cent. "China's economy is still facing relatively big downward pressure," the PBOC said. "At the same time, the overall level of domestic prices remains low, and real interest rates are still higher than the historical average," it said. Sunday's rate cut came just days after weaker-than-expected April trade and inflation data, highlighting that China's economy is under persistent pressure from soft demand at home and abroad. While the PBOC acknowledged the difficulties facing China's economy, it said in its statement accompanying the announcement that it wants to strike a balance between supporting growth and deepening structural reforms. As part of these reforms, it lifted the ceiling for deposit rates on Sunday to 1.5 times the benchmark level, the biggest increase in the ceiling since it began to liberalise the interest rate system in 2012. 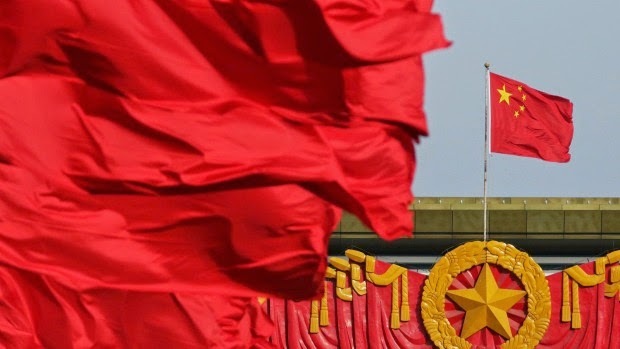 Economists had said it was a matter of when, not if, China eased policy again after economic growth in the first quarter cooled to 7 per cent, a level not seen since the depths of the 2008/09 global financial crisis. Indeed, some analysts have even said recently that the PBOC had fallen behind the curve by not responding aggressively enough to deteriorating conditions. With China set to publish more key economic data on Wednesday, including industrial output and investment, the timing of the rate cut could add to worries that figures may disappoint across the board again, as they did in March. For now, however, some were confident that policymakers can arrest the slide. "Intensified policy loosening will help effectively halt the economic slowdown," said Xu Hongcai, a senior economist at China Centre for International Economic Exchanges, a well-connected think-tank in Beijing. A cooling property market and slackening growth in manufacturing and investment have weighed on the Chinese economy. Annual growth is widely forecast to sag to 7 per cent this year, down from 7.4 per cent in 2014. In an attempt to energise activity, the PBOC has now lowered interest rates and relaxed the reserve requirement ratio (RRR) five times in six months, and many economists believe more policy loosening is in store. This is partly because despite the steady drum roll of policy easing, there are indications it has not benefited the real economy. Some data suggests banks are not passing on lower interest rates to borrowers, and credit is still not flowing to the sectors in most need of the funds. "The effectiveness of the rate cut won't be very big," said Li Qilin, an economist at Minsheng Securities. "The PBOC has already cut benchmark interest rate by a total of 65 basis points, but borrowing costs have only fallen marginally." Banks are also struggling as the economy founders. Lending has slowed, bad loans are piling up, and profits margins are getting squeezed as China liberalises its interest rate market. Banks' earnings reports last month showed profit growth hit a six-year low in the first quarter. Given these challenges, the PBOC said it does not expect banks to pay savers the maximum deposit rate allowed by authorities. And with the prospect that borrowing costs may stay stubbornly elevated, government economists told Reuters earlier this month authorities may ramp up state spending to shore up growth, in the hope that fiscal policy would work where monetary policy hasn't. But Li Huiyong, an economist at Shenwan Hongyuan Securities, cautioned against thinking that lower borrowing costs would not trickle down to businesses and consumers at some point. "Don't underestimate the cumulative effect of the cuts in interest rates and RRR," Li said. "This won't be the last cut. "The rate could be lowered to 2 per cent at least, and we expect the economy to gradually stabilise in the coming two quarters."